WEST HARTFORD, Conn. – Redshirt-junior Christian Lutete (Silver Spring, Md.) 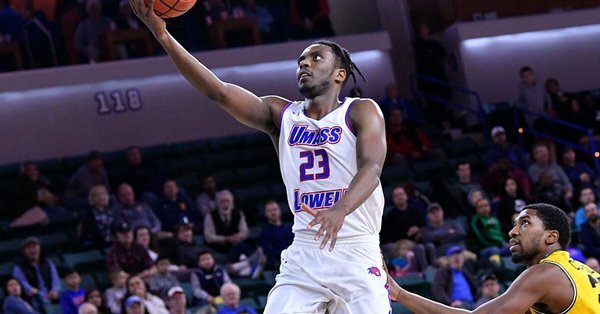 drained a personal-best seven three-pointers en route to a career-high 35 points, as the UMass Lowell men’s basketball team (11-9, 3-2 AE) battled back late to earn a 76-73 victory at America East foe Hartford (9-10, 2-2 AE) on Saturday. Hartford led for almost 32 minutes in the contest before Lutete knocked down back-to-back threes to put the River Hawks ahead, 64-61, with 6:20 left to play. The home team would close the gap to just one on five occasions in the final minutes, including at 74-73 with less than a minute to go, but Lutete converted on a pair of free throws in the final seconds to help his team hold on for the decision. The victory gave the River Hawks their third consecutive conference win for the first time since 2015-16, in addition to marking their best start in league action since 2016-17. Lutete, who now has two, 30-point performances this season, was joined in double figures by sophomore Obadiah Noel (Frederick, Md. ), who set a new career high of his own with 23 points, and redshirt-senior Josh Gantz (Grove City, Ohio) with 10 points. Noel controlled the River Hawks’ offense in the opening minutes, recording the team’s first 12 points of the day, but Hartford maintained the upper hand, taking a 16-12 advantage with 12:44 remaining in the first half. Lutete joined the scoring effort with a triple and a layup on two straight possessions to give his squad its first lead of the day, although Hartford followed with a 15-3 run to pull away, 31-20, at 8:30. However, the visitors clawed their way back, as Lutete drained another three to spark a 12-2 spurt that cut the difference to just 33-32 with 2:20 to go. Hartford was able to respond with five of the last seven points of the period, though, taking a 38-34 edge into the break. Hartford outscored UMass Lowell, 8-4, coming out of halftime, but Gantz, Lutete, and Noel combined for the River Hawks’ next 12 points to make it just a one-point game once more, this time at 51-50 with 12:30 still to play. A pair of threes helped the Hawks extend their buffer before the visitors began their final comeback. Hartford still owns a 10-6 advantage in the all-time series against UMass Lowell. Next up, the River Hawks head to Binghamton for a 7 p.m. tipoff on Wednesday, January 23.